POWER SKIFF 16 was designed for fishing, crabbing, working or just plain messing about. This design is a traditional power boat in plywood and epoxy materials. She has a flat aft run for planning speeds. She is rugged construction. A solid lumber sheerstrake adds to her appearance and strength. Her hull is glue and screw construction using 1/2" plywood coated in epoxy for years of use. A more traditional paint finish is possible for a serviceable finish as a working skiff. Build her and you will enjoy many hours of on the water. Plans include: materials, lines, construction. A full size frame plane is available. Estimated cost for quality construction materials (not including power) is $3000. This cost includes a high level of outfit and finish you can be proud of after putting the effort into building this fine boat. Purchase and Download Study Plans for the POWER SKIFF 16 for $5.00 in PDF format (zipped file). 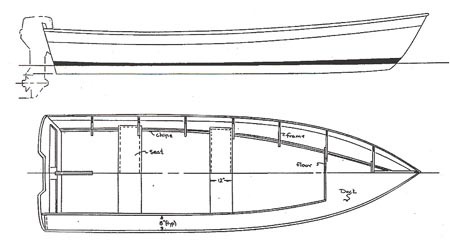 Purchase Construction Plans for the POWER SKIFF 16 for $65.00 for delivery by US Postal Service. Purchase Full Size Frame Lofting for the POWER SKIFF 16 for $65.00 for delivery by US Postal Service.